"Remember Velvett Fogg - you will hear the name again"
The latter part of the 1960s saw the formation of many new bands within the "underground" scene who would attempt to take pop music to a higher level of creativity. Birmingham also had its own flourishing underground music scene during that time with a variety of innovative groups emerging. The Velvett Fogg line-up were players whose common attributes consisted of an abundance of musical talent along with a desire to create something new and exciting. 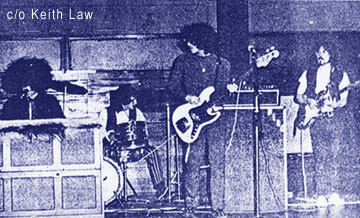 Velvett Fogg was formed in 1968 out of a respectable Brum band called "Gravy Train". They were fronted by soul singer Ernie Handy and the guitarist at that time was Bob Hewitt. The other band members were drummer Graham Mullett, bass guitarist Mick Pollard, and Londoner Frank Wilson who played Hammond organ. The band were soon off to Germany where they spent most of the year playing at army bases and clubs. Their exciting stage act included a light show and a go-go dancer (who later married Ernie). Upon returning to Birmingham, the band, now managed by an agency called Inter City Artists, was given a record deal by Jack Dorsey of Pye Records. At this time it seemed that the more unusual or controversial a band was, then the greater chance there would be for success in the record business. The record label was looking to sign unusual "underground" acts and Velvett Fogg were told to, in Jack Dorsey's words, "develop an image that would make people think you would piss on the pope"! The initial line-up of Velvett Fogg featured guitarist Tony Iommi (later to make the big time with Black Sabbath). Tony stayed in the band for only one gig before leaving to be replaced temporarily by Ian Leighton - described as "a great blues guitarist" by his friend Frank Wilson. It was during this time that Pye Records arranged a photo-shoot of the group for the cover of their proposed first album (more about that later). Material for the Velvett Fogg album would be supplied by local songwriter/guitarist Keith Law who became a friend of the band. Keith was a veteran of the West Midlands music scene having played in "The Williamsons", "Love and Understanding" and Paint (Jardine). Keith takes up the story; "I was in the Rum Runner one night, when someone told me that Velvett Fogg were looking for new material, and they introduced me to them. I arranged to meet them at their rehearsal place, Langley Baths. I went along the next day, and went through the following songs with them; 'Yellow Cave Woman', 'Once Among The Trees', and 'Within' The Night' and that was it! The next couple of days, they were in London recording". Before recording could begin in late 1968, Ian Leighton departed Velvett Fogg and was replaced by guitarist/vocalist Paul Eastment (a cousin of the band's previous guitarist Tony Iommi). Paul Eastment was also to contribute original compositions for the album along with Frank Wilson, Graham Mullet and Mick Pollard. "I was a classically trained pianist but we all had to play way below our capabilities"
Velvett Fogg recorded the tracks for their debut album under direction of Pye producer Jack Dorsey. Apparently, Dorsey aimed to get the band onto the then-popular "progressive" band wagon. "I was a classically trained pianist but we all had to play way below our capabilities" says Frank Wilson. The band were also allowed to record covers of a few songs they liked and these included psychedelic-sounding versions of 'New York Mining Disaster 1941' by The Bee Gees, and Tim Rose's 'Come Away Melinda'. 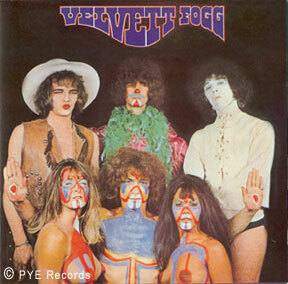 Velvett Fogg's self-titled album was released on the Pye label in January of 1969. Despite what some may have thought, the album stands up as a fine example of late 1960s British psychedelia. As well as the previously mentioned covers, original compositions such as 'Yellow Cave Woman' and 'Once Among The Trees' are both hypnotic if not compelling. By contrast, other tracks like 'Lady Caroline' and 'Plastic Man' had both homicidal and political overtones respectively. By far the most controversial feature of the Velvett Fogg album was the record cover. It displayed the pre-Paul Eastment line-up of the band wearing garish make-up/body-paint and costume but also included two well-endowed young women wearing nothing but strategically applied body paint! This politically-incorrect package was accompanied by a typically obscure sleeve note by the influential U.K. disc jockey John Peel who commented; "There is a lot of good music on this record. Remember Velvett Fogg - you will hear the name again." Along with the Velvett Fogg album, Pye Records also released a single by the group. It was a cover of the Tornado's classic instrumental 'Telstar' and was recorded by the band as requested by Jack Dorsey who hoped to cash in on the publicity surrounding the American moon landings taking place at that time. While receiving some radio play, the record did not sell enough copies to chart and a big advertising campaign planned by the record company to promote the album never materialised. The band did a bit of touring after the single came out. Perhaps discouraged by poor sales of the Velvett Fogg album, Pye seemed to lose interest and withdrew their backing. In the autumn of 1969 the group disbanded with the members going their seperate ways. Frank Wilson says; "I personally thought the first line-up in Germany was the best and most satisfying." He returned to London and joined Riot Squad and then "The Rumble Band" before following in Rick Wakeman's footsteps to join Warhorse in 1970. Paul Eastment started a Brum band called "Holy Ghost" - later to become Ghost with whom he recorded a couple of albums. He later fronted another group called Resurrection as well as recording with local folk singer Shirley Kent. Keith Law stayed in the music business, continued to write songs, and became a successful entertainer in the South-West of England. Keith passed away in 2017. During the years since Velvett Fogg's demise, demand amongst collectors for copies of their (now very rare) album has increased considerably. Original albums have changed hands for high prices with bootleg copies also known to be in circulation. Fortunately, in 2002 the Sanctuary Records Group Ltd. re-issued the album officially for the first time on CD (CMRCD619) and it is strongly recommended for those who are fans of the British psychedelic or early progressive sounds of the late 1960s. Keith Law and Frank Wilson are back together writing and recording for a proposed new Velvett Fogg album. Word has it that an Italian record company is already showing a lot of interest in the project! "Remember Velvett Fogg - you will hear the name again..."
Many thanks to Keith Law and Frank Wilson for assistance in preparing this Velvett Fogg biography exclusive to the BrumBeat web site.